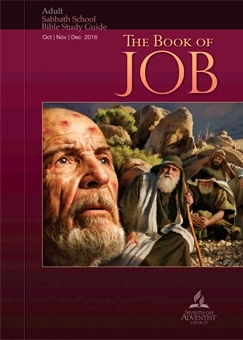 COMMENTARY ON "CHARACTER OF JOB"
This week’s lesson examines Job’s character, his sanctification, his past exercises in faithfulness that laid the foundation for his faithfulness in suffering, and challenges the reader to live a life committed to demonstrating faithfulness through meeting needs of the suffering. In fact, given the Adventist understanding of “perfection”, this apparent contradiction can be harmonized within the Adventist worldview. In Adventism, “perfection” always refers to something that happens within a person. The idea of a completely alien righteousness being credited to our account is not part of Adventist dogma. Therefore, when the lesson comes close to expressing what Scripture says about Christ’s righteousness, and about our perfection in Christ, while the words sound the same, the concept differs from that in Scripture. Biblical perfection and righteousness is always IMPUTED, not IMPARTED. God doesn’t give us righteousness that makes us godly; He credits us with Himself. Those whom God counts as righteous are those who believe Him—not those who are committed to becoming better or pious or observant. The lesson makes much of explaining that Job had been faithful before his temptation. It even asserts that Job’s accumulated obedience and piety and good decisions gave him the strength of character to remain faithful in his great trial, that his experience with being faithful gave him the strength not to curse God and die. This explanation, however, still depends upon the view that man participates in his own sanctification and faithfulness to God. In fact, there is a mystery regarding sanctification that we cannot fully explain, but the issue becomes clear when we understand how the Bible defines “righteousness”. Adventism defines “righteousness” as “right doing”, “obedience”, “character perfection”, and so forth. The Bible defines righteousness as believing God. Then he [Abraham] believe in the LORD; and He reckoned it to him as righteousness. “Blessed are those whose lawless deeds are forgiven, and whose sins are covered; blessed is the man against whom the Lord will not count his sin” (Romans 4:1-8). “Righteousness” is not behavior or actions. Rather, the biblical definition of righteousness is faith and trust in God alone, trusting that He will do everything He says. It is giving up all our ideas of how we may please God and placing our trust and faith in the Lord Jesus, the living fulfillment of all God’s promises and the shadows of the law (see Luke 24:44). When we understand righteousness is not behavior or practices or observance, the story of Job looks very different. Righteousness is not relative. It is not progressive, or something for which Heaven as different expectations for us at different times. Righteousness truly is all or nothing. If it were dependent upon observance or behavior, Abraham could not have been counted righteous by believing God. Abraham’s behavior was heinous many times after that event recorded in Genesis 15. He took Hagar as a concubine; He allowed Sarah to go into Abimelech’s home, pretending she was merely his sister. Yet these egregious breaches of trust did not undo Abraham’s designation as “Righteous”. Abraham’s righteousness was based entirely upon his belief, his faith in God, and in God’s eyes, he was credited with perfection because Abraham trusted the LORD. Significantly, the Bible does not say that when we belief we become righteous; rather, it says belief is the means by which we are counted righteous. To be counted righteous is to be declared righteous quite apart from how our observances may look. We do not acquire righteousness or become righteous; rather, we are declared righteous when we trust the finished work of Christ for our salvation! Job’s righteousness, therefore, had nothing to do with his having been pious and observant. Rather, Job trusted God. Job 1:8 even declares that Job was one “that feareth God”, as the lesson quotes on page 164. Job’s resistance of evil and dependence upon God was not how he became righteous; his fear of God is what defined his character, or heart. His godly behavior was the consequence of the Lord God working in Him. In August of 1513, Luther began expounding the Psalms. When he came to Psalm 22—“My God, my God, why has Thou forsaken me?” (KJV)—he was comforted by the fact that Christ Himself had been deserted by God. This must have been worse than the scourging, the thorns, and the nails. Thus, in Christ, Luther found someone who was overcome by a sense of alienation from God, Anfechtungen. Christ, Luther realized, must have experienced this because He bore our iniquity. and what he was about to learn was that the wrath of God and the love of God were brought together—both attributes were fully satisfied by the cross. When Luther began to teach the book of Romans, he trembled at the phrase “the righteousness of God” (Rom. 1:17). Though he says he was an “impeccable monk,” he stood before God as a sinner troubled in conscience. the righteousness of God struck fear into his heart because he knew that it was because of God’s unbendable righteousness that sinners were cast away from His most holy presence. He pondered day and night the connection between the righteousness of God and the justice of God, and the statement “the just shall live by faith.” Other passages also came to mind: “And to the one who does not work but believes in him who justifies the ungodly, his faith is counted as righteousness” (Rom. 4:5). He now understood that the “righteousness of God” not only refers to an attribute of God, but it could also be a gift from God to sinners. He no longer feared the justice of God; rather than hating God’s justice, it now became inexplicably sweet. God opens His heart to those who have true faith in Christ as Savior, and Christ’s holiness meets the demands of the law for us. Luther realized that we are saved by sheer grace and mercy thanks to the gift of the perfections of Christ. In the gospel we learn that sinners can be declared to have the righteousness of God attributed to their accounts. For those who believe, God has granted forgiveness and has put legions of demons to flight. Adventism insists that we can obtain “righteousness by faith”. In fact, the Bible NEVER says we obtain righteousness by faith. What it does teach, however, is that we are JUSTIFIED by faith. Justification is not the same as righteousness. Justification is the declaration of God that we are no longer under condemnation for our legitimate guilt and sin. Without making anything right, without offering any sacrifices, we are JUSTIFIED FREELY by the death of the Lord Jesus when we believe in Him. Belief in Christ, by the way, is not not intellectual assent, although that detail is included. Belief that saves is the realization that the Lord Jesus has literally become sin for us and has offered His own body and blood as an eternal, sufficient sacrifice for all our sin—past, present, and future—and when we trust in His shed blood, when we trust Him as our Lord and our Savior, we are, as Luther experienced, born again, just as Jesus told Nicodemus a believer must be. Righteousness by faith is another deception. We never BECOME righteous. We are always sinners saved by grace and born of the Spirit and adopted by the Father. Yet this new identity we receive is not everyone’s identity. Only those who trust Christ alone are born again, born of the Spirit, and adopted by the Father. When we are born again, though, we are DECLARED righteous. This declaration has nothing at all to do with how well be obey or put sin in our flesh to death. This righteousness is God’s declaration of us, and it is a just declaration when we are covered by the blood of Jesus. As Martin Luther realized, God’s justice and his righteousness were fulfilled at the cross, and when we believe, we are transferred out of our spiritual death and into the life and righteousness of the Lord Jesus. We do not become righteous by faith. The Bible says that the righteous (those who are counted righteous because they believe, as Abraham and Paul and every believer has been) LIVE by faith. We do not become righteous in any sense except that the Lord credits our account with the actual personal righteousness of the Lord Jesus when we trust Him. We are, however, justified by faith when we trust Christ. God declares us not merely forgiven but counts us as if we had never sinned because we have been covered by the blood of Jesus. He credits us with the Lord Jesus and His righteousness. Job’s character had nothing at all to do with his faithfulness to God nor with his enduring Satan’s torment. Rather, God’s character is the active agent. Job believed God and trusted Him, but even pious Job did not understand God’s sovereign vastness and inscrutability. God not only allowed Satan to see how His own justice limited Satan’s homicidal resentment of Job’s faith, but He allowed Him to see that God preserved and strengthened and taught Job as he suffered without losing faith in the God whose word he believed. Nevertheless, Job had to learn that God’s faithfulness had nothing to do with his own righteous behavior. At the end of the book Job repented for having dared to speak about how God’s justice “worked”—he repented of having spoken of things to deep for him to understand. As Christmas approaches, I invite the reader to watch two lessons on the mystery of the incarnation of the sovereign God to become our Savior. Adventism has a diminished view of the deity of the Lord Jesus and a weak but benign view of our triune God. It also gives Satan a much more important place than he actually holds, and it gives man ultimate choice and authority, insisting that God’s limits Himself to man’s decisions. These views are unbiblical and obscure what Jesus actually did and who He actually is. Copyright 2016 BibleStudiesForAdventists.com. All rights reserved. Revised December 16, 2016. This website is published by Life Assurance Ministries, Camp Verde, Arizona, USA, the publisher of Proclamation! Magazine. Contact email: BibleStudiesForAdventists@gmail.com.